How have I waited so long to read The Handmaid’s Tale by Margaret Atwood? It’s a classic, and has been televised, and is the kind of thing that sometimes you don’t read because you think you know all you need to about it. The Handmaid’s Tale was published in 1985 and I really should have read it long ago. Sometime in the 20th century a Christian extremist sect sets up a totalitarian theocracy in the US. The handmaids are a caste of women able to have children which is now a rare ability, due to widespread sterility. It’s not clear if that because of environmental toxins or out-of-control STDs. Offred doesn’t know what’s true and what isn’t, so neither does the reader. 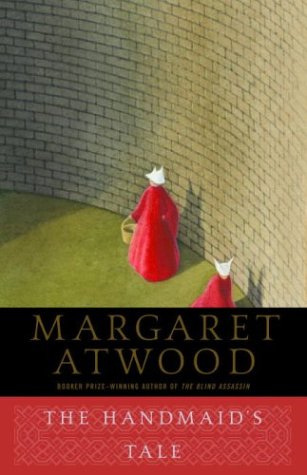 The ruling elite use propaganda to create the beliefs they want the populace to have, and much of what the narrator, Offred, relates is what she’s been encouraged to believe. The parallels between that and the distortion of reality created in today’s media are striking. Offred describes her life, her illegal relationships with the Commander and his driver, Nick, and her eventual escape via an underground railroad. It is compelling. The claustrophobic nightmare of Offred’s life is vivid. What struck me the most was the boredom. Offred has nothing to do. People are not permitted to read or to write and a handmaid’s only role is to breed. Offred is allowed a daily trip to obtain rationed food but she has no other role, so she spends a lot of time on her own in her room doing nothing. There are exercises and prayers but Offred is not a true believer. I was gripped by the story. I’d expected, as it was published in 1985, to find it dated. Scarily, the opposite was true. It seems like a future that is only a couple of steps away. One or two wrong turns and we could easily end up there. Atwood’s realisation of the impact of living in a totalitarian society is chilling. It’s an important book and is still relevant. If you haven’t read it yet, don’t wait any longer. Buy my book Fragments at Amazon or Smashwords. “It’s a classic, and has been televise” — you mean, a movie? (avoid the movie, it is painful). I also recommend Suzy McKee Charnas’ rather more radical Walk to the End of the World (1974) — it has a similar premise but is more than ten years earlier. I thought there’d been a BBC series, but it seems not, so I must mean the movie ;-). I haven’t seen it. Thanks for the recommend, I’ll look it out. Our society isn’t that close to tolitarianism, at least not Western ones.If you want to see religious extremism, look in the Middle East. I’m not racist – I just don’t think that Islam justifies all that abuse. I can’t wait to read this. Everything I read by Atwood is great. She’s especially good at describing what it’s like to be a woman. Cat’s Eye is the best I’ve read by her so far. I considering adding it to my list of personal best.